Register Log In GliderCENTRAL Forums HELP! I'M NEW... Northeast Florida breeders? There just happens to be a very wonderful and long standing breeder right near you in St Johns, FL. On GliderCENTRAL she is know as Srlb or you can find her on fb, Peggy Hernandez Brewer. I believe she is out of town right now visiting family but I will send her a message about your post here. I cannot say anything discouraging about Priscilla at the Pet Glider as she gets very good reviews about the gliders she ships. If you want a local breeder you could visit, then Peggy would be a wonderful choice, IMO. And that was Peggy forgetting to sign in You will love talking to her. Thanks! I remember Peggy now! I've done research on breeders in the past but couldn't remember where exactly they were located. 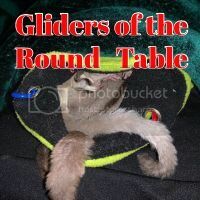 Does anyone know of a good glider vet/clinic here also? I've researched sugar gliders for years and read on sugar glider forums etc but this is one thing I'm not sure on. I know of a few vets that treat them, but I don't know who would be the most glider savvy.